Off day photo because of the beautiful weather and the cute little joint we lunched at in downtown Santa Ana. An old band tee and hair on top of hair piled on my head is characteristic of my lazy days. Customers that recently purchased items should be receiving them in the next few days, if not already; moreover, my closet shop will be on hiatus until its re-opening this February. No fear, I will still be populating the page with updates and outfits. You look super cute!! I love your bag! I love all your outfits! Your style is amazing:) That shorts are WOW, I want them! I love the tee. I need to invest in some. I love your topknot with heavy bangs, round sunnies and hot pink lips. Now that I've joined the bang brigade I'd love to try something similar. Welcome to the bang clan! I feel like I've had bangs since I was born, haha. Your tights are so much fun. Wearing all black right now where I live is such a bad idea! You pulled the look really well, I wish I could do the same. Looking at your stockings makes me wonder ... how hard was it to put it on?! 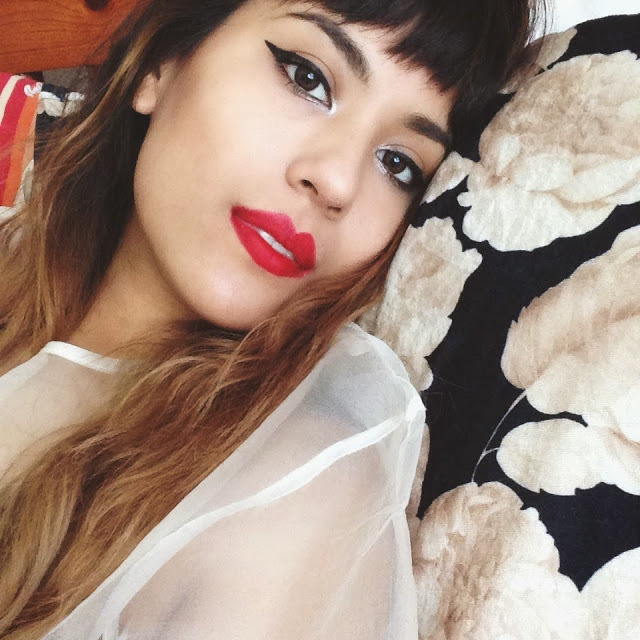 Love your look here and your lipstick is a killer shade! obsessed with this look! so cute!